The aim of this randomized controlled clinical trial was to evaluate the possible advantages of adjunctive hyaluronic acid (HA) application in the coronally advanced flap (CAF) procedure in single Miller class I/recession type 1 (RT1) gingival recession treatment. Thirty patients with one recession were enrolled; 15 were randomly assigned CAF + HA and 15 to CAF alone. The recession reduction (RecRed), clinical attachment level gain (CAL-gain), changes in probing pocket depth (PPD) and in the width of keratinized tissue (KT), complete root coverage (CRC), and mean root coverage (MRC) were calculated after 18 months. Post-operative morbidity (pain intensity, discomfort, and swelling) was recorded 7 days after treatment using visual analogue scale (VAS). After 18 months, RecRed was statistically significantly higher in the test group (2.7 mm [1.0]) than in the control group (1.9 mm [1.0]; p = 0.007). PPD were found to be slightly but statistically significantly increased in both groups. No statistically significant difference was found for KT gain between treatments. CRC was 80% for test and 33.3% for control sites (p < 0.05). A MRC of 93.8 ± 13.0% for test and 73.1 ± 20.8% for control sites was calculated (p < 0.05). The test group reported lower swelling and discomfort values 7-days post-surgery (p < 0.05). Statistically significant difference was not found for pain intensity. The adjunctive use of HA was effective in obtaining CRC for single Miller class I/RT1 gingival recession sites. Adjunctive application of HA in the coronally advanced flap procedure may improve the reduction of the recessions and increase the probability of CRC in Miller class I recessions. Gingival recession is a common clinical finding in patients with high standards of oral hygiene and can be found in more than 90% of patients [1, 2, 3]. Buccal exposure of roots with esthetic impairments and dentinal hypersensitivity represents the most frequent reasons for these patients to seek treatment . Gingival recession therapy still poses a certain challenge for clinicians, as it has in past years . The ultimate goal of root coverage procedures is the complete coverage of the recession defect with an esthetic appearance comparable to adjacent healthy soft tissues in combination with physiological probing pocket depths [6, 7]. Several surgical techniques have already provided good results and have been shown to attain root coverage at individual recession sites with a variety of different methods [7, 8, 9, 10]. To date, connective tissue grafts (CTG) and enamel matrix derivatives (EMD) in conjunction with a coronally advanced flap (CAF) have been shown to provide the highest probability of obtaining complete root coverage (CRC) in Miller classes I and II single gingival recessions as compared to CAF alone . Pilloni and co-workers , suggested that the application of EMD enhanced significantly the extent of root coverage, the clinical attachment gain (CAL-gain), and the keratinized tissue (KT) augmentation. A recent meta-analysis on the effect of CTG and EMD in root coverage procedures concluded that when combined with CAF, CTG contributed more to increase KT width, whereas EMD seemed helpful for wound healing and resulted in a reduction of probing pocket depths . Hyaluronic acid (HA) is a major component of the extracellular matrix in almost all tissues. The primary role of HA is to bind water and to allow the transportation of key metabolites and therefore to maintain the structural and homeostatic integrity of these tissues . HA suppresses tissue breakdown activating metalloproteinase inhibitors . It represents one of the most hygroscopic molecules known in nature . As a physical background material, it functions as space filler, lubricant, and a protein excluder as well . In vitro and animal studies have demonstrated that HA significantly increases the tensile strength of granulation tissue , stimulates clot formation , induces angiogenesis , increases osteogenesis , and does not interfere in the calcification nodules during bone formation . Furthermore, HA facilitates cell migration and differentiation during tissue formation and repair of both soft and hard tissues . Recently, it has been shown to improve ligament cell viability, and even early osteogenic differentiation in vitro . All these aforementioned properties are essential for tissue regeneration and wound healing. Considering the fact that it has been demonstrated that HA has positive effects on wound healing, we hypothesized that it may also improve the results of root coverage by CAF, as it was observed with EMD . Therefore, the aim of this randomized controlled clinical trial (RCT) was to evaluate the potential benefit of the adjunctive use of HA in combination with CAF and to compare the outcomes with CAF alone, when treating single Miller class I gingival recessions . The present randomized controlled clinical trial was performed according to current standards of clinical research (CONSORT guidelines) (http://www.consort-statement.org). Two different treatment modalities were compared: a coronally advanced flap in combination with hyaluronic acid application (CAF plus HA; test group) and the CAF alone (control group). The CONSORT diagram of this study is presented in Fig. 1. Thirty systemically healthy adult subjects (14 females and 16 males) ranging in age from 21 to 47 years were enrolled at the clinical center in the Section of Periodontology, Sapienza University of Rome, Department of Oral and Maxillo-Facial Sciences, in the period comprised between September 2015 and April 2017. The study protocol (ClinicalTrial.gov-NCT03204565) was approved by the local ethical committee (#2538/15). The inclusion criteria were (1) age ≥ 18 years, (2) no systemic diseases or pregnancy, (3) no smokers, (4) no systemic antibiotic therapy in the last 6 months, (5) no active periodontal disease at sites (probing pocket depth < 4 mm and no bleeding on probing), (6) full-mouth plaque score (FMPS) and full-mouth bleeding score (FMBS) < 15%, (7) presence of at least one buccal recession (depth ≥ 2 mm) with no loss of interproximal attachment classified as Miller class I /RT1  in the anterior maxillary or mandibular area (central and lateral incisors, canine, and first and second premolars) and associated with esthetic problems and/or dental hypersensitivity were included, (8) gingival recession with at least 1 mm of keratinized tissue (KT) apical to the recession, (9) presence of a clearly identifiable cemento-enamel junction (CEJ), (10) no teeth with prosthetic crown or restoration with the cervical edge in the CEJ area, and (11) no history of mucogingival or periodontal surgery at the experimental site. Teeth with abrasion of the CEJ were previously treated with a composite to reconstruct the CEJ before surgery. Anatomic landmarks on adjacent or contralateral teeth were used to identify the correct CEJ position without extending restorative material more than 1 mm apical to the ideal CEJ level . The patient was the statistical unit and each patient contributed to this study with one single gingival recession. In case of multiple recessions, the deepest one was selected, and when the recessions were of the same depth, the selection was performed by tossing a coin. All surgical procedures were performed by one experienced operator (AP) with more than 10 years of experience in periodontal plastic surgery. All experimental procedures were performed in the same clinic (Section of Periodontology, Sapienza University of Rome, Department of Oral and Maxillo-Facial Sciences). An examiner (MR), who was completely blinded with respect to the surgical procedures, assessed all the clinical parameters and the visual analogue scale (VAS) questionnaires. A preliminary training and calibration session on five periodontal patients revealed an intra-class correlation coefficient ≥ 0.75. Data collection included clinical measures and photographs (horizontal format 1:1) at baseline and 18 months. Post-operative patient morbidity assessed by VAS questionnaires was recorded 7 days after mucogingival surgery. Recession depth (Rec): At the mid facial site on the considered tooth measured from CEJ to the gingival margin. Probing pocket depth (PPD): At the mid facial sites. Clinical attachment level (CAL): At the mid facial sites. Calculated as Rec + PPD. Keratinized tissue (KT): Measured from the gingival margin to the MGJ at the mid facial point. Recession reduction (RecRed), CAL-gain, mean root coverage (MRC), and complete root coverage (CRC) were also evaluated at 18 months post-surgical procedure. All patients were pre-treated by scaling/root planing to obtain optimal infection control when required and received oral hygiene instructions (roll technique) with a soft-bristled toothbrush to correct the harmful habits related to buccal recession etiology at least 2 months before surgery. The surgical technique used was previously described by Zucchelli et al. . Following local anesthesia, two oblique and divergent releasing incisions extending beyond the mucogingival junction (MGJ) were performed. An intra-sulcular incision was performed at the buccal aspect of the involved tooth (Figs. 2a, b and 3a, b). Care was taken to raise split thickness surgical papillae. A full thickness flap until the MGJ was then elevated using a small periosteal elevator. Subsequently, a partial thickness flap was raised beyond the MGJ, eliminating residual tension to achieve a passive coronal displacement of the flap (Fig. 3b) A gentle root planing was performed using a curette up to 1 mm from the bone crest. The anatomic interdental papillae were carefully de-epithelialized. The allocation sequence, sealed in opaque envelopes, was unconcealed during the surgical intervention and after flap preparation. The surgeon was informed as to whether or not hyaluronic acid was to be applied on the root surface. For the control group, only CAF was performed. For the test group, cross-linked HA (Hyaluronic acid, hyaDENT BG, Bioscience, Germany) was applied covering the root surface before flap suture (Fig. 3c). The material represents a highly concentrated hyaluronic acid gel, is of non-animal origin, is based on a mixture of a cross-linked HA (16 mg/ml), and is a natural HA (2 mg/ml). It is characterized by a slow degradation pattern (several weeks). HA is presented as individual cartridge for single use only. To the application on the denuded root surface, the cartridge was inserted into a cartridge syringe with 23G needles, as the fabricant recommended and the HA was applied on the root surface until completely covered. Finally, the flap was coronally displaced and sutured covering the CEJ . The suture started with interrupted sutures at the vertical releasing incisions in apical-coronal direction to reduce the tension, facilitating the coronal displacement to perform the last coronal sling suture . 6-0 monofilament nylon and polypropylene sutures were used, indistinctly distributed in each group (Prolene prolypropylene 6-0. Ethicon, Ethilon nylon 6-0. Ethicon, Johnson & Johnson, Somerville, NJ, USA) (Figs. 2c and 3d). Post-operative pain and edema were controlled with anti-inflammatory drugs. Patients received ibuprofen 600 mg at the end of the surgical procedure and were instructed to take another tablet 6 h later; subsequent doses were indicated only if needed. Amoxicillin (1 g every 12 h) was provided as well during 5 days. All patients were instructed to intermittently apply an ice bag on the operated area . All patients were instructed to discontinue tooth brushing and avoid any trauma at the surgical site. A 60 s rinse with 0.12% chlorhexidine digluconate was prescribed two times/day for the first 2 weeks. Two-weeks after surgery, the sutures were removed and the patients were instructed to brush with a post-surgical soft toothbrush. Patients were recalled for follow-up (and professional oral hygiene/maintenance procedures and clinical measurements as needed) after 1, 2, and 4 weeks and after 3, 6, 12, 15, and 18 months post-surgery (Figs. 2d and 3e). The use of a soft toothbrush was discontinued only after the 3-month follow-up. Then, a medium-sized bristle toothbrush was prescribed. After explanation of the post-operative instructions, patients were given an evaluation questionnaire. The interviewer (MR) performed the questionnaire with the patient evaluating pain, swelling, and discomfort at 7 days after procedure using VAS scale ranging from 0 (no pain/swelling/discomfort) to 10 (maximal pain/swelling/discomfort). The difference between pain and discomfort was explained to the patients since often these terms are understood as similar. Discomfort was defined as a subjective unpleasant feeling that the patient does not interpret as pain and which can include symptoms such as discommodity and nuisance but is tolerable, and is generally related to chewing and talking discomfort. Dolor was defined as an acute symptom, not tolerable to the patient if prolonged over time having the need to be controlled by analgesics. The sample size was calculated assuming α = 0.05 and the power of sample (1-β) = 80%. For the variability (σ = S.D. ), a value of 0.46 mm was selected according to previous paper  when considering Rec at baseline as a covariate. The minimum clinically significant value (δ) set at 0.5 mm. Considering possible dropouts, the number of the patients was also increased by of 15% for each group. On the basis of the data and these assumptions, 15 patients for the test group and 15 for the control group were required to be entered in this study. Each patient was randomly assigned to one of the two groups. Allocation concealment was performed using opaque and sealed envelopes, which were sequentially numbered. The allocation sequence was determining using a computer-generated randomization list (IBM SPSS, Version 22.0, Chicago, IL, USA). One examiner (MR), who was not involved in the treatment sequence, was assigned to open the envelope, immediately after flap elevation. The treatment was communicated to the operator (AP). The examiners were not aware of the type of procedure performed but the patients were aware of this. Data for RecRed, CAL-Gain, PPD, and KT changes were tested for normal distribution using the Kolmogorov-Smirnov test of adaptation and the Shapiro-Wilk test. RecRed and CAL-gain values were calculated from baseline and 18 months data. In case of non-parametric distribution, continuous data was tested for possible inter-group differences using the Mann-Whitney U test. Therefore, data was described by median values and the interquartile ranges (M [IQR]). Ordinal data were tested by Pearson’s chi-square test. Intra-group differences for the different time points were assessed with the Wilcoxon Signed-Rank test. Data for MRC was presented by means ± standard deviations and tested with Student’s t test. Inter-group differences regarding CRC were again tested with Pearson’s chi-square test. The level of significance was set at p ≤ 0.05. All data were analyzed by statistical computer software package (IBM SPSS, Version 22.0, Chicago, IL, USA). Thirty patients were enrolled in this study. Fifteen patients were treated with CAF + HA and 15 patients with CAF alone. There were no dropouts in either group and no significant complication were reported (Fig. 1). Overall, in the test group, four canines (two upper, two lower) and eleven premolars (seven upper, four lower), were treated. In the control group, six canines (five upper and one lower) and nine premolars (seven upper and two lower) were treated. In the test group, seven females and eight males were treated with CAF + HA. The median age [IQR] was 30 years . The control group consisted of seven women and eight men with a median age of 30 years . Details of baseline data are presented in Table 1. No statistically significant difference at baseline between the two groups was evident (p > 0.05). Details of the clinical outcomes at 18 months are presented in Table 2. From baseline to 18 months, significant improvements for Rec (p < 0.001 in the test group; p = 0.001 in the control group) and CAL (p < 0.001 in both the test and control groups) were found in both groups. PPD were found to be slightly increased in both groups, but without any signs of inflammation. KT did not change in any of the groups. At 18 months, the median Rec decreased significantly in both groups. The comparison between the two groups showed statistically significant differences (p = 0.011). The RecRed at 18 months was higher for the test group (2.7 mm [1.0]) than the control group (1.9 mm [1.0]). The difference between groups was statistically significantly different (p = 0.007). Although CAL improvement was significant for both groups at 18 months, the comparison between them showed statistically significant differences in CAL (p = 0.011) and CAL-gain (p = 0.023), which were in favor of the test group. In both groups, PPD value increased during 18 months. The comparison between the two groups showed no statistically significant differences (p = 0.717). Values of KT did not change for the test and control groups between baselines. No differences were found between the two groups (p = 0.116). The MRC and CRC values at 18 months were higher for the test group than the control group and the difference was statistically significant (p = 0.003 and 0.025, respectively). Whereas swelling and discomfort were statistically significantly lower in the test group (p = 0.010 and p = 0.029, respectively), no such difference was found with regard to pain intensity (p = 0.151; Table 3). To date, a robust body of evidence reports positive outcomes following the use of CAF, CAF + EMD and CAF + CTG in the treatment of localized gingival recession sites [7, 9, 11, 12]. The consensus report of the AAP Regeneration Workshop  concluded that a subepithelial connective tissue graft (SCTG) represents the most effective treatment modality for Miller classes I and II single-tooth recession defects and provide the best root coverage outcome, but it is important to highlight the fact that also it has been observed that the incidence of adverse effects in gingival recession treatment, such as discomfort with or without pain, was also directly related to the donor sites of SCTG . Therefore, research always aimed to find suitable alternatives to reduce patient morbidity and enhance the intervention predictability. The present RCT assessed the benefits of adjunctive HA application in combination with CAF in Miller class I single gingival recession treatment and compared it with CAF alone. The results of the present study showed that, 18 months after treatment, test (CAF + HA) and control (CAF alone) procedures resulted in a consistent RecRed but it was significantly higher for CAF + HA group. The same situation was observed for MRC and CRC. On the other hand, the test group reported lower swelling and discomfort values 7-day post-surgery with not significant difference for pain intensity. HA has been claimed to be a potent anti-inflammatory agent, which is able to modulate wound healing due to its ability to scavenge the inflammatory cell-derived reactive oxygen species . The substance has been used extensively in the field of dentistry for various beneficial reasons . In periodontics, it has been used to treat gingivitis , periodontitis [35, 36], and in the treatment of periodontal intra-bony defects . However, to the best of our knowledge, there have been limited clinical application studies in the field of root coverage procedures performed and still no consistent published data with longer follow-ups on the usage of HA are available. Due to the biological properties in wound healing [32, 33, 38], HA might be an option to reduce overall patient morbidity and may lead to better clinical results when treating gingival recessions. A study conducted by Pini Prato et al. showed that a more coronal level of gingival margin after suturing resulted in a higher probability for complete root coverage . Accordingly, in this study the flaps were advanced and sutured as coronally as possible in both groups. It is known that the interface between tooth and the mucogingival flap (that rests primarily on the suture) is vulnerable and can be easily disrupted by mechanical forces for a considerable period of time post-surgery . Considering that wound stability is a key factor in attaining a successful outcome in regenerative periodontal procedures, it could be inferred that the wound stability achieved at the surgical sites contributed to the higher root coverage. It can be assumed that the higher root coverage percentage, obtained at the test sites in the present study is attributable to the known angiogenic property of HA, its role as an hydrating agent, and its property of enhancing motility of lymphocytes, inflammatory, and connective tissue cells [18, 32, 38, 40, 41, 42]. In addition, the decreased patient morbidity reported in the present work can also be attributed to the same properties since statistically significant differences in discomfort and swelling 1-week post-operative (with higher values for the control group) were found. Moreover, it is important to emphasize that it has been demonstrated that post-surgical topical application of HA reduces the wound healing time. Shorting this critical time period might also help to improve the wound stability . 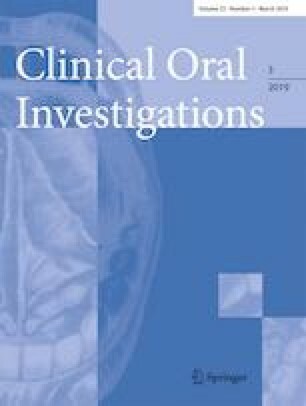 Casale et al., in a systematic review, concluded that topical HA application can be useful as an adjunctive treatment in gingivitis, chronic periodontitis, as well as during the post-operative period both for implant and sinus lift procedures for faster healing leading also to reduce patients’ discomfort during the post-operative period. Bevilacqua et al. concluded in a clinical study that the topical application of 0.8% HA gel in addition to modified Widman flap (MWF) surgery improved the CAL and gingival recession coverage more than MWF surgery alone or the application of a placebo gel. Romeo et al. showed that the use of a gel containing amino acids and 1.33% HA, topically applied three times per day for 1 week was able to promote faster healing by secondary intention in biopsy wounds of the oral soft tissues, which were induced by laser, as compared to healing in the control group. Therefore, the application of hyaluronic acid might considerably accelerate the repair processes although it does not seem to affect pain perception. Rajan et al. 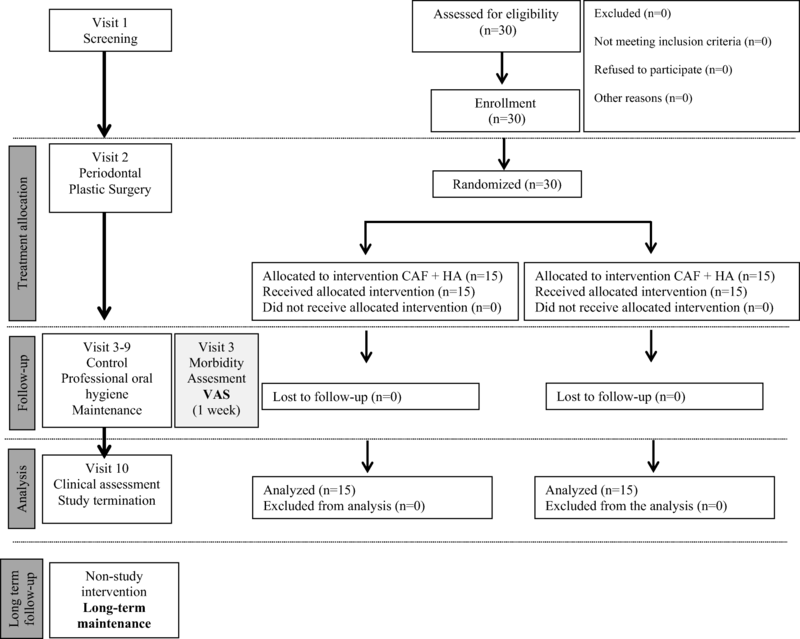 , in a 9-month clinical study, compared CAF + HA versus CAF + SCTG in recession treatment. They found only significant differences in PPD between the groups, favoring the test group (HA). In the other clinical parameters (Rec, KTW, CAL, MRC), they found significant differences after 3 months but not at the end of the study. It is interesting to note that, in the present study, PPD values in the control group (CAF alone) showed a broader range after 18 months. This fact—together with the enhanced recession coverage of the test group—underlines the beneficial effect of the HA application. One possible reason is the antibacterial effect of high molecular weight HA gel on periodontal pathogens . A previous study has reported beneficial effect in PPD reduction of HA in conjunction with scaling and root planning [35, 36]. In addition, in the aforementioned study , the authors concluded that HA increased the probability of achieving root coverage but significant differences in terms of root coverage could not be found due to the small sample size and the short follow-up time. Patient morbidity was not evaluated in this study. In this context, we believe that the patient’s subjective response to treatment is also relevant, but it should be emphasized that a comparison should be made with CAF alone or with other procedures, which do not involve a second surgical site, since this may influence the results and act as a confounder. A recent RCT compared CAF + HA with CAF alone evaluating patient morbidity. They reported that significant differences were not found in none of the clinical parameters. . Since the follow-up period was much shorter (6 months) than the present RCT, it is questionable whether it would be adequate to compare our results with the latter study. The results obtained in the present RCT regarding MRC and CRC in the control group (73.1 and 33.3%, respectively) were comparable to those reported in another study . Also, it is interesting to note the resemblance of these MRC and CRC values in the test group (93.8 and 80%, respectively) with those reported in another clinical study obtained with CAF + SCTG procedure (93.8% for MRC and 79.0% for CRC) . On the other hand, when the pain intensity was evaluated, the difference between both groups was not statistically significant but it is important to consider that when pain is evaluated, an intrinsic variability, dependent on the patient and also extrinsic variability between patients, may occur. Therefore, it is difficult to interpret pain perception data . These difficulties could be reduced, potentially, with a split-mouth study design. Among the identified priorities for future research in the consensus report from the AAP Regeneration Workshop, Tatakis et al. mentioned that there is limited evidence on patient-reported outcomes and that additional research on pain, esthetics, patient satisfaction and quality of life is needed. To this end, the current study is the first randomized clinical trial to evaluate patient morbidity outcomes with HA use in the treatment of gingival recessions and the results appear to be promising. However, this study has also certain limitations. The number of subjects is low and patient morbidity evaluation did not really consider other important parameters such as amount of analgesic consumption. On the other hand, as HA may show resorption over time, recurrence of the recession defects may be expected and this should be evaluated by comparing the outcomes at different intermediate time intervals. Moreover, the fact that this study did not have a split-mouth design should also be considered. It was decided not to perform a Bonferroni correction of the p values of the clinical tests for different reasons. Main reason was that the already very conservative Bonferroni correction would have been reflected in an underestimation of the differences, since testing for recessions, pocket depths, and clinical attachment loss are not independent parameters but different measures to describe—more or less—the same situation around the respective tooth in terms of position of the gingival margin. Future studies should include more a higher number subjects evaluating more patient-related parameters according to the suggestions made in the AAP consensus report . A coronal advanced flap, with adjunctive hyaluronic acid application, is a predictable and safe method for single Miller class I gingival recession sites treatment. The present findings indicate that the use of HA may not only improve the clinical results, but also could represent an option to reduce patient morbidity. All procedures performed in the present study were in accordance with the ethical standards of the institutional and/or national research committee and with the 1964 Helsinki declaration and its later amendments or comparable ethical standards.